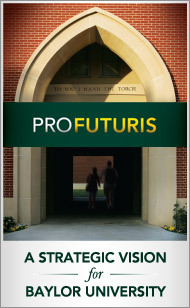 On May 11, 2012, the Baylor Board of Regents adopted Pro Futuris: a Strategic Vision for Baylor University. Developed over the course of two years, Pro Futuris reflects the input and wisdom of the extended Baylor community. This web site was utilized over that two year period to solicit input from the Baylor community and to communicate progress as the plan developed. Pro Futuris serves as a compass for our future, providing direction without dictating specific actions — us toward our destination while inviting creativity in determining the paths by which we will arrive. It follows on the heels of the very successful “Baylor 2012” vision which ushered in unprecedented growth and development at Baylor impacting every area of university life. We have named our new vision Pro Futuris, an extension of Baylor's beloved motto, Pro Ecclesia, Pro Texana. It reminds us that our past is inextricably linked to our future, and that responsibility to God, and to the world, continues to lead us. We invite you to visit the Pro Futuris web site to learn more. 165 input documents were received from groups of faculty (48%), staff (47%) & students (5%). Input was gathered from Baylor alumni, parents and others in 10 Texas cities and 6 other cities across the country (in a total of 19 different sessions) (there is a map in one of the documents that shows the coverage). 299 individuals submitted input via a web form. This input came from alumni, students, the Waco community, parents, faculty and staff. A team of 23 faculty, staff & students coded, analyzed and synthesized all input. The input was summarized across 12 strategic themes which were determined by the 23 member committee.